What a beautiful, whimsical series. You always inspire me to create more! 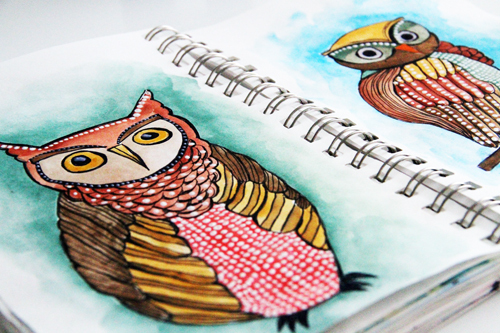 ^___^ My favorite thing to do on your blog is to check out your "sketchbook"-so inspiring! Hope that you find sometime to rest with your little one! wow!! so bice!! I love all your sketching! !kisses from Czech!! Súper lindos! Para el cuarto de Lucy? How beautiful. I love them. You really inspire me. I love your drawings and thanks for sharing your sketchbook pages. sweet! (could a precious little angel baby be your inspiration for this???) Congratulations on your new life. Eat up every moment! Love these! And the flowers in your sketch book... And the earrings made by uour guest blogger! Very cool! 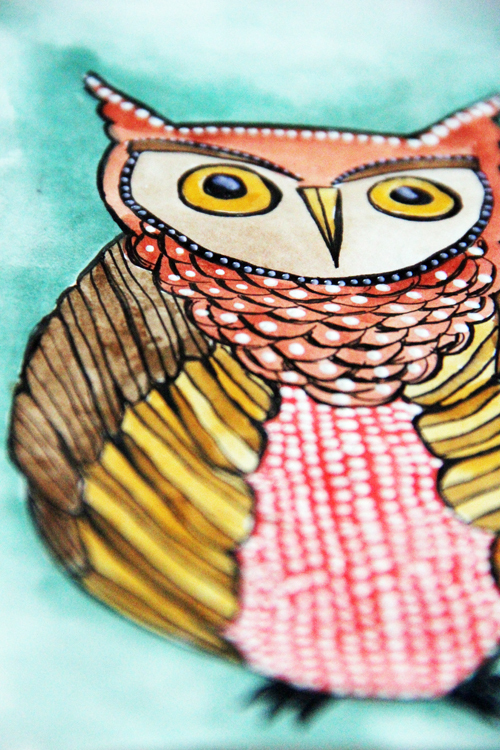 Alisa, I love your owls! 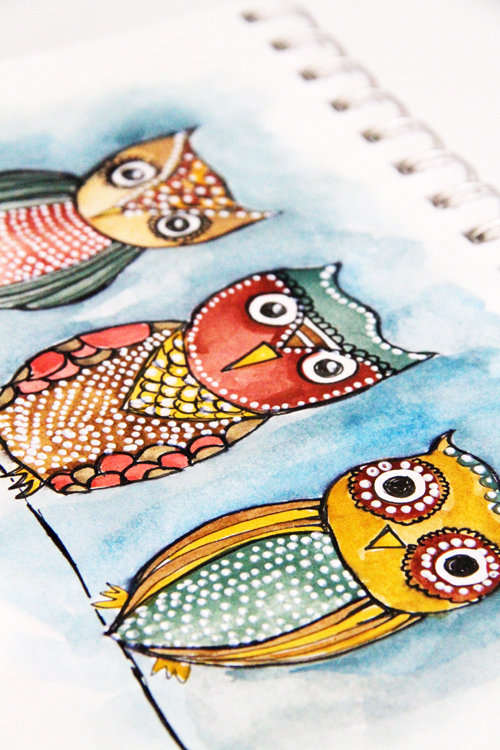 Happy, colorful, fun owls! I can see them bringing smiles to many people!! Oh my gosh, I LOVE owls and yours are terrific!!! Never seen owls being transferred to such cuties. I took a watercolor class last year and painted some owls, but was never happy with them. They were bright and cute but 'flat'. Your addition of white accents is superb and I think that's just what my flatties need :) As always, you are a wealth of inspiration! Love your work . . . always . . . I so enjoyed taking your Watercolor Bliss course and I am so glad to see you are making time to create beautiful things with being a new mommy! You inspire me over and over again!!! In love with your owls and the color you used !! Inspiring !! Fabulous owls! your sketchbook is always very inspiring. your watercolor class is next on my art bucket list! Love your owlies! cutest owls I've ever seen!! I love owls and adore your art! Your sketchbook is so inspiring! they're beautiful, all of them! The owls are so lovely. I find it intriguing how topics such as 'owls' go through popular fazes. Why is this I wonder? They are sooo life-like...the colors are brilliant, amazing! Hugs! Adorable! 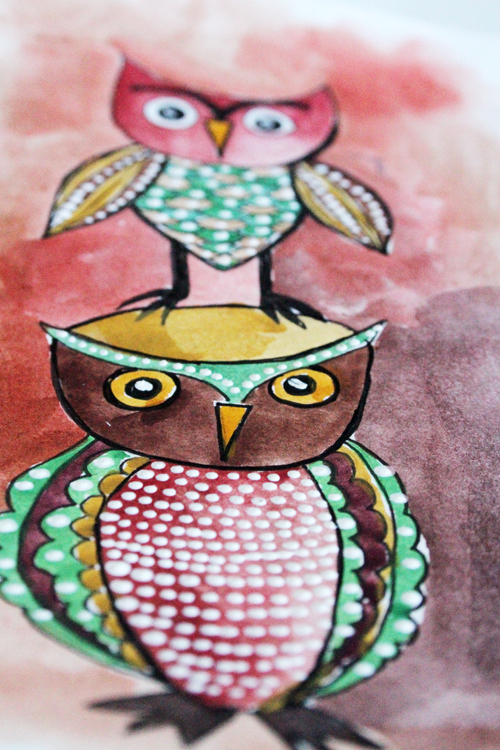 Love owls and been wanting to learn watercolor - what a perfect inspiration for me! Wow... they're so cute! My fav is the little guy on the other guys head... love them! 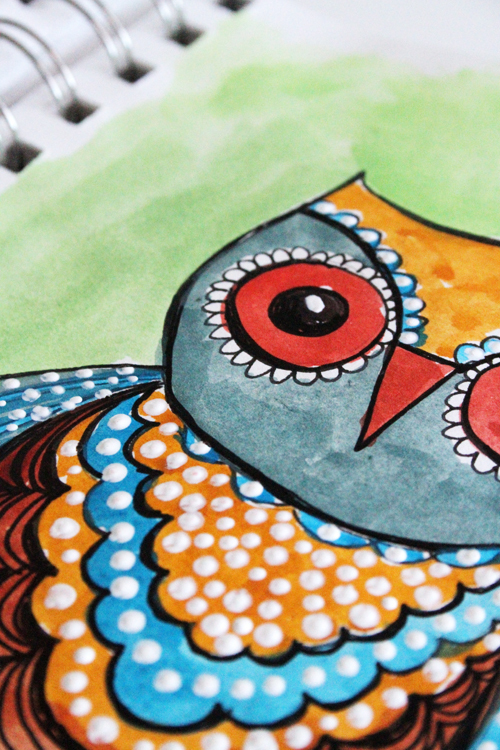 Owls are magical creatures...even more so in your paintings! 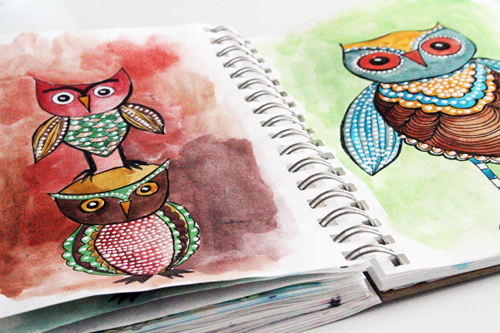 I really enjoy your colorful owls they are nicely done! 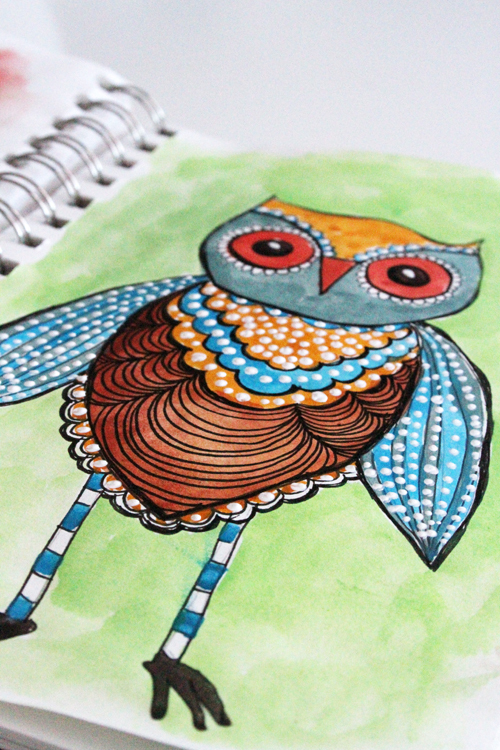 Oh man, I kiiiinda have an owl problem & these beautiful sketches completely made my night! Love, LOVE! I'm working on a woodland themed baby shower for a friend who is having a baby girl...these were the perfect inspiration for the party! PLEASE say you are selling prints! stumbled upon your blog and LOVE the sketchbook!! 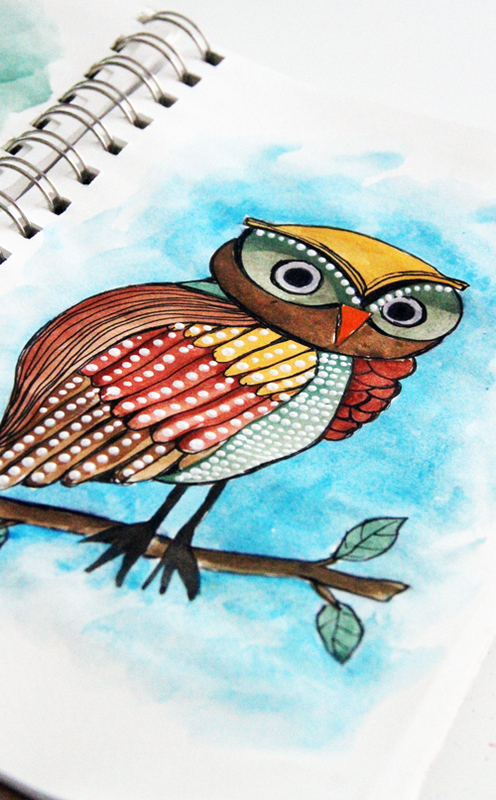 I am inspired to try my own :) Love the owls! haute holidays online class WINNERS! haute holidays online class and a GIVEAWAY! !